Tuesday February 21st 1922 Cora ironing in forenoon. I doing for Hattie and reading. Was down to Fannies in afternoon and slept late in afternoon. Rob & Cora out to supper. I wrote a long letter to Birdie. Wednesday February 22nd 1922 I went to an Elder Daughters party at the Hutchinsons. It was a Washington birthdays party. Some of the ladies in costume. I stopped at Fannies later. A rainy evening. I wrote William and to May Baker. Thursday February 23rd 1922 Hattie still in bed. a windy day and much colder. Cora doing the work but has bad cold. I read some. Letter from Lizzie Lindley. Friday February 24th 1922 I helped Cora some with the work and did things for Hattie. I wrote to Lydia and Lizzie. She left Los Angeles today for home. Saturday February 25th 1922 The weather very nice. I helped Cora with the work. I went to town with Rob, was at The Library. to call on Edwin Nixon and Ida Bailey. Then went to the Cemetery to be near Will a few moments. Walked back down town. Went to see "The Boy" (a show). Got my supper in town. Walked home past Otts. Hattie was up in afternoon. Cora away to a party. Hattie got Robs supper. 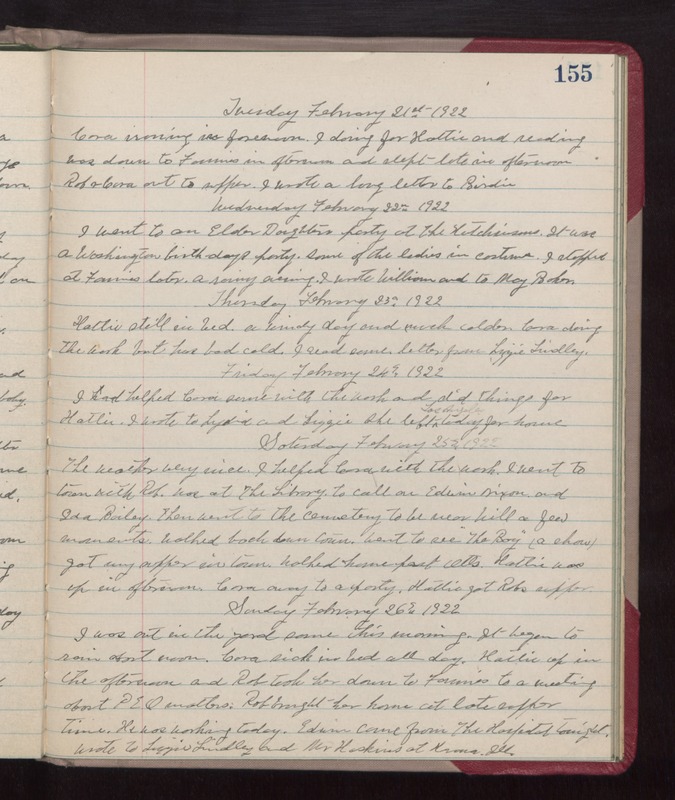 Sunday February 26th 1922 I was out in the yard some this morning. It began to rain about noon. Cora sick in bed all day. Hattie up in the afternoon and Rob took her down to Fannies to a meeting about P E O matters. Rob brought her home at late supper time. He was working today. Edwin came from The Hospital tonight. Wrote to Lizzie Lindley and Mr Haskins at [Krona?] Ill.